SimpleLogic Wires is a mod which adds redstone, insulated and bundled cables. Redstone cables function much like redstone dust, but they can be placed on any face! Insulated cables come in one of sixteen (dye) colours, don't connect to wires of other colours and don't emit "strong" redstone power. Bundled cables combine the sixteen insulated cable colours as separate channels, allowing you to transmit sixteen signals in one cable! All of the cables come in freestanding and non-freestanding ("grounded") variants. Shift-scrolling lets you switch between the wires you have in your inventory without opening the inventory menu! 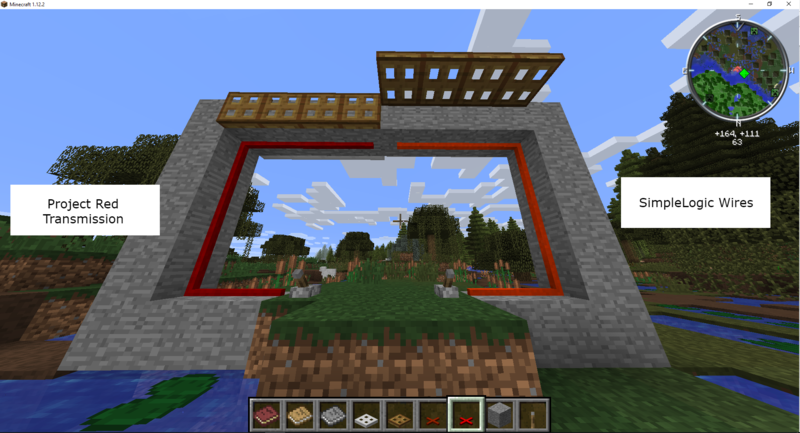 Since the wires are based on MCMultiPart 2, you can use existing mods (such as Chisels & Bits) to block off connections. The wires keep the analog value of the signal input into them - but do not decay it! The wires used to be slightly wonky in 1.10. The big bugs have been fixed, but small ones may still lurk. That's why it's a beta! "Fancy" bundled cable rendering is not yet available for freestanding cables. For those of you familiar with the 1.9/1.10 releases of Charset, the wires in this mod are a direct descendant of those. This mod requires CharsetLib and MCMultiPart! Some redstone cables seem to be crashing my server. MC 1.12.2 with forge 2772. Latest version of SimpleLogic Wires (cables, charset, etc). I've noticed the redstone cables had been lagging some things that worked fine with redstone (vanilla). It hadn't crashed the server until now. Best I can describe what i was doing, I was replacing redstone (vanilla) with redstone cables while some trains were running over detector tracks (tripping the redstone). Crash log is shown in spoiler. Let me know if I can post this anywhere else. Sorry for responding this late, but I don't really have a fix that wouldn't involve a ground-up rewrite of the mod - which I cannot promise for 1.12.2. This is great! I've never messed around too much with redstone because it's so unwieldy, but I'm definitely going to try more of it now. Thanks! Same here. I see that the insulated cable works, but I assume that it just acts as vanilla redstone. mod does not works at all. i will not download a 3rd party mod for it to work . it ether works on install or it does not .thumbs down. What 3rd party mod, sorry? All of the dependencies are neatly listed. The complete log can be found here. I'm running MC 1.12.2 FORGE 2749 with SimpleLogic-Wires 0.5.4.7 and CharsetLib 0.5.4.7. However, I tried running it without other mods and the problem and error log are exactly the same. I hope this issue can be fixed, thanks in advance. 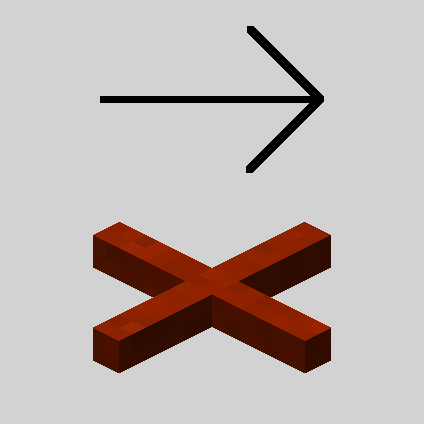 If you're using SimpleLogic Wires, you need MCMultiPart, not Forge MultiPart. Oh, thank you very much. I'm sorry for this, it wasn't very clear to me that i need MCMultipart itself. I only thought its code was based upon it. I think its more clear if you add that to the bottom next to CharsetLib, but thats just a suggestion. Oh, no, I was referring to the wire mod, as that's where you posted. Lib had a bug briefly where it needed MCMP2; this has been fixed. Yes, i know. But at the end of this mod description it says "This mod requires CharsetLib!". So i thought it would be more clear if it says "and MCMP2"
edit: I think there has been a misunderstanding, the wire mod description states that i need CharsetLib and nothing else. Thats why i assumed the wires where under the charsetlib tab. Regarding that issue - there's an update to SimpleLogic Wires to bring it up to 0.5.4.8, but it's stuck in CurseForge's queue. I try to push them all simultaneously, but this particular release of 0.5.4.8 had a crash-on-start issue so I had to upload a fixed version. Is it possible to have the Redstone cable transmit the Redstone signal through the block its attached to? I like to hide my cables, so I usually place them on the underside of a block. I know Project Red's wires work, but if your mod did as well, its a much lighter mod overall and would be interested in using it. Fixed in 0.5.3.1, coming up! By the way: Since SimpleLogic Wires are based on MCMultiPart, you can actually use existing mods (such as Chisels & Bits) to hide your wires in the same block space. I think Redstone Cables still emit through such obstructions. Thanks for the update. I verified the redstone signal is transmitted when I hit the lever now, however, turning the lever off does nothing, the trap doors still think they have a redstone signal. https://gfycat.com/ExemplaryEminentKillifish <- Could not reproduce. Do you have a reproduction scenario? Ahh, I forgot to update CharsetLib. Its all working now. Thanks!